Mulholland Drive makes most people think of the eponymous neo-film noir classic by David Lynch – at least outside of California. The road winding through the Santa Monica hills is of course well-known within the state. It was opened in 1924, and car wrecks have slowly been piling up along the more chaotic parts of the road ever since. The drive has inspired many a photographers, among them Jason Knight, who is fascinated by derelict places and abandoned objects (take a look at his collection of photos here). As nobody had ever made an attempt to document the wrecks thoroughly before, he decided to grab his camera and explore a more abandoned stretch of the wreck cemetery downhill from a dangerous curve. Capturing the more well-known wrecks rotting closer to the path posted no challenge, but some of the others left in the abyss were not so easily accessible and hard to spot in the first place. 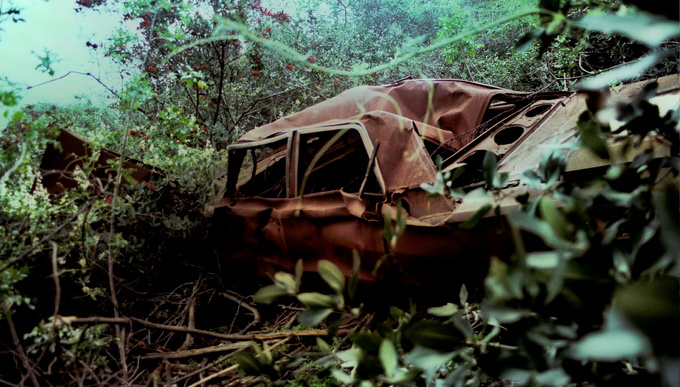 One of the photographed wrecks caught his attention by a crank shaft sticking out of the ground, while another gave itself away by forming a rusty patch in the thick flora. Knight even found a car that has almost sunken into the sand entirely. He ended up taking photos of altogether seven wrecks, most of which must have been left there in the ‘80s or a bit earlier. The survival of the wreck cemetery of Mulholland Drive can only be attributed to the lack of funds. Plans of salvaging the ruins have been made many times, but went up in smoke every time as the competent authorities copped out of the project. Lifting a body half-eaten by rust out of the bottom of an abyss is not easy, and the administrative authority would not be able to cover the costs thereof. 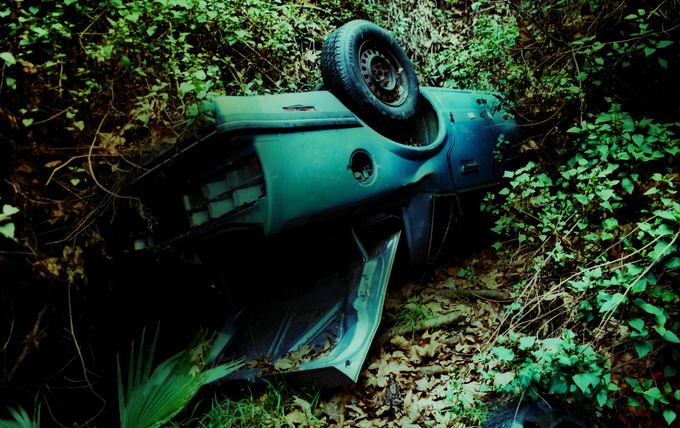 Knight's photographs have called public attention to the subject once more, but as most of the cars have been left in inaccessible places, vandalism is hardly something to worry about. The wrecks will probably keep on rusting till Mother Nature gets the better of them. Please click on any of the pictures to view the full gallery. 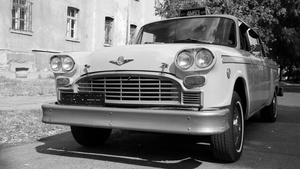 Everybody knows this car, has seen it in a myriad of American movies and recognizes it as “the” New York cab. When you drive out into the traffic, everybody points at it, saying: “Hey look, a... a....” let me help you. It’s a Checker Marathon.